In 1952, NCFR was instrumental in organizing a Midwest Ad Hoc Conference on the proposed U.S. Family Department of Welfare. The conference was to facilitate inter-professional consideration of family welfare and the implications of a proposed federal welfare department. The conference took place in Chicago on February 27, 1953 and was sponsored by NCFR, nine midwestern state councils and several other organizations. NCFR President Robert Foster presided. Chair of the day was Fred Hoehler, CEO of the Citizen’s Committee of Greater Chicago and formerly Director Illinois Department of Welfare. Keynote speakers were Helen Ross, Administrative Director, Institute of Psychoanalysis, and Paul Magnuson, Chair of President Eisenhower’s Commission to study the Health Needs of the Nation. Just a few weeks later, President Eisenhower’s push to elevate the Federal Security Agency to cabinet status was successful, and the Department of Health, Education, and Welfare (HEW) was born. 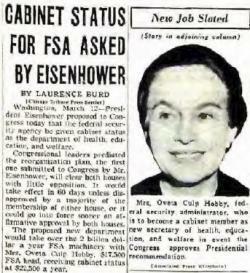 Mrs. Ovela Culp Hobby was named its first secretary, becoming the only woman in President Eisenhower’s cabinet. In 1979, HEW was renamed the U.S. Department of Health and Human Services (HHS), when its education functions were transferred to the newly created United States Department of Education.